This prealgebra course is fairly similar in content to Saxon's Algebra 1/2. The text is Prealgebra, 5th Edition by Aufmann, Barker, and Lockwood, published by Cengage Learning. This approximately 650-page, softcover textbook includes instruction, examples, exercises, tests, and answers to odd-numbered problems in the exercises. It comes with a softcover Student Solutions Manual that contains step-by-step solutions to odd numbered exercise problems, and all "end of chapter" and "cumulative review problems." The text first reviews basic math skills and concepts, including exponents and radicals, before moving on to topics such as polynomials, first-degree equations, the rectangular coordinate system, measurement, proportion, percent, geometry, statistics, and probability. Even though this level of math covers many algorithms with no immediate applications, this text still includes many word problems and practical applications that are listed in the left margin of the "Contents" for each chapter. Periodically, lessons include mention of how to use a scientific calculator with a few questions directing students to perform calculator operations. Calculator use is introduced at this level, and students should use a scientific or graphing calculator with the course. Courses such as this used to be considered eighth grade level, but the new math standards have advanced the math agenda, so this is now considered seventh grade level in most states. While checking over my daughter's math review today, I could see how much your math has meant to her since switching from another curriculum. Already after two sections of prealgebra with you, her confidence is soaring. I just wanted to write and say, once again, how pleased I am with your program! My son has recently finished your Pre-Algebra program. We just received his scores back from the Iowa Test of Basic Skills, and my son's National Percentile Ranking in mathematics was 97%! We couldn't have been happier! God bless you! You are certainly an answer to prayer!! "I am continually impressed with your company. You have always gone beyond in your customer service area. This exact service is what has led me to recommend you to several other homeschooling families. I just wanted to write and say how much I LOVE your math programs! I grew up memorizing how to compute math problems without understanding the concepts behind them. As a result, I developed a real dislike for all mathematics. I saw the same situation happening with my twelve year old son. My son wants to be an engineer, so a strong mathematical foundation is crucial to his success. Out of desperation, I pulled him out of the public school and started homeschooling him using your wonderful curriculum. WOW! What a difference your program has made. We now truly understand the concepts behind the math and have developed a love for the subject. We can't wait to start the lessons each day! You have opened up a whole new world of wonder, not just to my school aged son, but also to his adult mother! Thank you so much! One reason I switched to Chalk Dust was so he could see and HEAR the explanations because plain textbooks seemed to be a struggle for him. We have used Chalk Dust Pre-Algebra and Algebra for his older brother and have been very happy. Thank you for your efforts to support homeschoolers including your clear presentations and availability of help. Moms with multiple children like me appreciate the division of labor. Our one-year old dances to your introductory music, just like her 5 year old sister did a few years ago. By the way, we are friends with the Wilhelm family whose daughter Rebekah you quoted on your website after receiving a 1600 on her SAT. They were the first to introduce us to Chalk Dust." "Our son completed the Pre-Algebra course this year. I would like to thank you for providing homeschoolers with such an excellent program. We are now reviewing Pre-Algebra to prepare for Algebra 1. Our grade 5 daughter has already joined with her brother to watch many of the Pre-Algebra DVDs. Thanks to the quality of teaching and systematic presentation on the DVDs, she knows she will not be overwhelmed when she takes Pre-Algebra in grade 7. The DVDs provide a wonderful introduction to each new section of each chapter in the Houghton Mifflin text book. It made the Math text that would otherwise seem fairly complex and possibly overwhelming for a twelve year old seem so simple. We are all looking forward to receiving the Algebra 1 program. Please compare Video text with Chalk Dust Prealgebra. Note: Chalk Dust Company provides accredited color textbooks, complete step-by-step solutions guides, numerous application problems, and more than 100 problems per section (ie lesson) on average from which to choose. Chalk Dust uses one on-camera math teacher (Dana Mosely) who provides high-quality technical support directly to your student (no actors). The comprehensive DVDs or VHS tapes correlate to each textbook and focus upon teaching concepts with numerous sample problems. "I have two children--one who graduated from high school in 2003 and a sophmore in high school. I have used Chalk Dust's Pre-algebra, Algebra I, Geometry and Algebra II. My oldest daughter is taking Calculus in college and is scoring at 98%. I attribute her success to her excellent foundation in math from Chalk Dust! Thank you." We ordered and began using your Prealgebra course this school year (we're homeschoolers). I wanted to let you know that my daughter is doing fantastic and really enjoying the course. I have nothing but compliments for the videos. The material is very well presented and Dana is outstanding. We rewind and review the occasional joke as often as the rest of the material and it has been fun and educational. Go figure!! Thanks for the great product. We will be ordering Algebra soon and giving Chalk Dust a recommendation to our homeschool friends. Have a great day!! 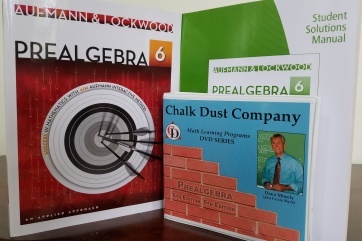 Chalk Dust Prealgebra is an excellent introduction to algebraic concepts, as well as a comprehensive review of basic math. The lessons on the videos or DVDs are presented in an easy-to-follow, no-nonsense manner with clear chalkboard demonstrations. I reviewed the video version. The video and DVD lessons follow the chapters in the textbook. Your student's on-camera teacher is personable and explains the lessons clearly and directly to the student, anticipating possible problems before they arise. There is no fuss from onscreen students, so lessons move smoothly. Lesson times on the videos vary from a few minutes to around an hour. They can be divided into as many sessions as necessary to complete and master the material. Chalk Dust recommends keeping each session to 60 minutes or less. Adding to the strength of the program is the availability of the on-camera instructor via e-mail or telephone, should your student experience problems with a concept. The reference text is Prealgebra: A Worktext, 2nd edition from Houghton Mifflin. The course was recently updated to include a hardbound textbook and a complete solutions guide. Topics covered are whole numbers, integers, fractions, decimals, and real numbers, percent, geometry, and statistics and probability. The softbound solutions guide contains the solutions for every problem, including the chapter tests and final exam. Chalk Dust Prealgebra starts with a review of basic math. In the second "chapter" of this course (each chapter corresponds to a videotape), you're already getting into algebraic-like expressions. The sequence is as follows: whole numbers and exponents, integers, prime numbers and fractions, fractions and mixed numbers, decimal numbers and square roots, percent with applications, algebra topics I, algebra topics II, statistics, and geometry and measurement. Some of these same topics are covered in Basic Math, but here the coverage is much more robust. However, an honors student�one who grasps concepts quickly and generally scores 95 percent or better on assignments�can skip directly from Basic Math to Algebra I.